300 : Rise of an empire is based on the latest Frank Miller graphic novel and follows the visual style of the first film from 2006. Originally the VFX were supposed to be provided mainly by Rhythm & Hues studios, but when the company -sadly- filed for bankruptcy and all the work was confiscated by the court, a group of other vendors had to redo the entire movie in a fraction of the time originally bid. MPC contributed to the final product with a team supervised by Charley Henley. Given the very difficult circumstances I felt I had to wear the “artist’s hat” and contribute doing two of the trickiest shots to support the environment/DMP team led by a tireless Marco Rolandi. Client: MPC // Warner Bros.
Thermopylae passage // DMP before compositing. This full DMP shot was based on a sketch by the client which gave a clear indication about the composition and the light direction. Following these instructions I built the image in several layers, which were projected onto custom geometries modelled by Tiziano Fioriti, to allow for some camera movement. Then I have assembled a few plates in Nuke to create a water layer that would fit the rest of the DMP. Using a few simple tricks to fake shadows and reflection onto the water surface I made sure all these layers felt connected together. As a final touch to give a bit more life to the shot I rendered a specular pass and introduced some deformation nodes to my Nuke script which were distorting the bushes and the clouds to convey the impression of sea breeze. The sense of movement was enriched even more by the crowd team which added soldiers and birds to the picture. When a show or a sequence has a strongly art directed look I always prefer to work with neutral colours rather than baking the final look onto the raw elements. My goal is to realize an image that looks like a plate before any manipulation. This ensures that all the elements are integrated well with each other and all the gradings are done properly. Moreover, this approach makes sure that my DMPs stay flexible if the visual direction changes. So, in the end Mirek Suchomel finalized the shot in compositing grading it and adding a few mist elements to match the other shots in the sequence. Persepolis // DMP before compositing. 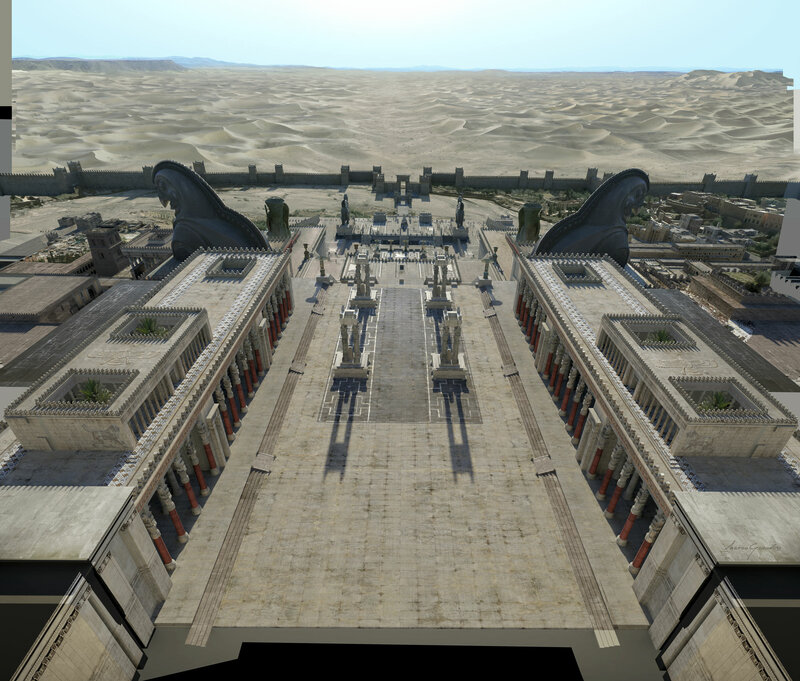 For the film MPC created a very extensive asset of Persepolis with plenty of detail to serve an entire sequence in the film, however the trailer scheduled required us to provide this shot way before we had textures and final modelling, so the only option we had was to proceed with a digital matte painting approach. The layout department imported the single pieces of the city in a Maya scene, which I have then subdivided in several layers according to the camera point of view, in order to avoid echoes when re-projecting the matte painting onto the geometry. We rendered these layers at 8K using a gray shader and Mental Ray physical sun and sky to have a clear indication of the volumes, perspective and lighting. Once these renders were imported and recombined in Photoshop, I started using Smart Objects to place dozens of architectural textures and building details, giving a photographic look to the otherwise grey objects. The lighting of the matte painting was then refined through several adjustment layers, and some extra buildings were added close to the fortification walls together with the dunes outside the city. A few secondary layers to add animated specular highlights were also saved for Gianfranco Sgura to play with later on in compositing. 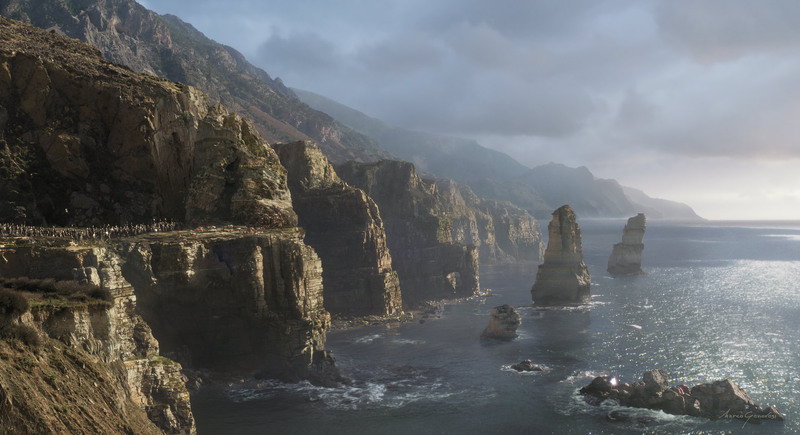 Whilst Tiziano Fioriti was using our Maya custom tools to project back the matte painting, Sebastien Gourdal simulated the movement of the flags between the columns. From gathering the city geometry to deliver the renders it took me 3 days and a full night to do my tasks. So, this shot really was a challenge and it required me to use pretty much any trick of the trade I knew, however a very lucky aspect of it, which allowed me to focus just on certain areas was the swarms of people looking at Xerxes, which Marco Carboni created using MPC custom tool ALICE. So, finally the 14,000 crowd agents, together with smoke, flames and lens effects were layered by Gianfranco in compositing, adding the final touches to the shot. Persepolis // Original plate and final shot.